Welcome to the first giveaway on The Blue Elephants! Since I moved from my old website in July, I have gotten so much support and feedback from everyone who reads, subscribes, and sends me pictures of their finished products. I started this blog on a whim, but I did not expect over a thousand people to be interested in what I was doing. As a thank you to everyone that’s subscribed, comments, or even just reads, I wanted to give you something that I love. This year, I finally got myself a set of crochet hooks (I’d been using hand-me-down ones before) and they are just amazing. 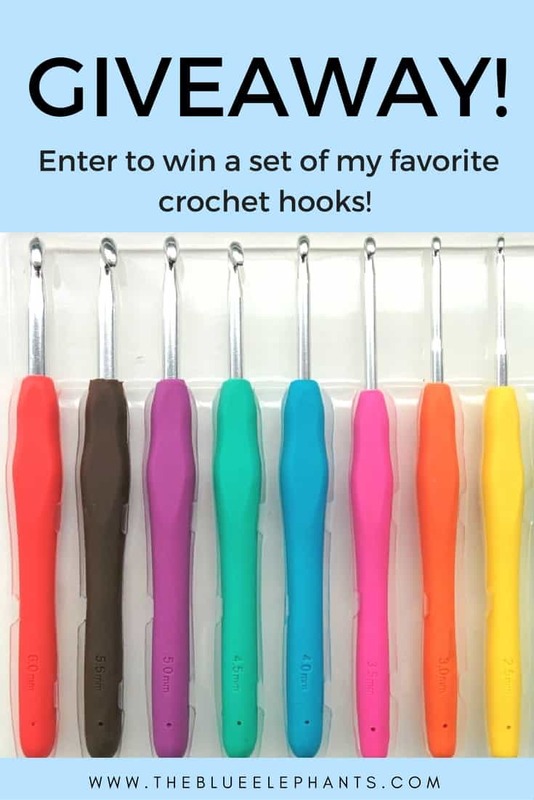 I got the Knit Picks Bright Crochet Hook Set, which includes 9 different hooks with bright, rubberized grips. They have made crocheting so much easier and more comfortable for me, and it’s so much more fun working on new projects. So, I wanted you guys to have a set too! Once I realized how much I loved mine, I wrote a review of them and bought a second set for you guys. It’s a small prize, but I hope you’re as excited about it as I am! Related: The #1 Thing You Need to Crochet Better! To enter, fill out the widget below. You only need to comment on this post to enter, but the more tasks you complete, the more entries you have! The winner will be chosen at random and I will email you if you won. Love the looks of these hooks!!! I’m making shawls as gifts this year. I love to crochet scarves and hats the most! Love your site, thanks for the great giveaway. I would have to say amigurumi is my favorite to crochet. It doesn’t require a lot of yarn, usually projects are quick and best of all they are fun to give as gifts. I agree! I love the little amis but I get carried away and make huge versions instead lol! Right now I am on a slouchy beanie kick! I can’t stop making them!! I’m pretty new to crochet but I think baby blankets are going to be my favorite thing to make. My favorite thing to crochet is probably amigurumi’s since I have done so many of them and I don’t lose my attention span making them. But I would love to do more wearable crochet. Maybe start with smaller/simpler wearable projects? I love my Infinity Scarf and the boot cuffs (both patterns are on the blog!) because they’re quick to make and super easy! I like crocheting scarves and hat. I love to crochet hats and cowls!! My favorite thing to crochet are slouchy beanies! Fun & fast! oooh, I need to try one of those! Everything is my favorite thing to crochet while I am working on it. I love hats and scarves, mittens and fingerless gloves. Right now I am making a fun hat and a scarf for my husband… When these are done I will find another favorite thing to crochet ! The only things I’ve crocheted are scarves and baby blankets. Baby blankets are definitely my favorite! My favorite things to crochet are baby items. Anything baby! It’s so nice to sit down to you favorite show with your current project, isn’t it? It’s my favorite part of the day! I have been looking for comfortable hooks. These look like they would work and I like the colours. Thank you for having this giveaway. I love to crochet headwarmers and scarves! There hooks look super! My favorite thing to crochet are my dolls. I love to crochet scarves and cowls, especially chunky ones! Superscarves are fun too. They make such great gifts; I am working on a few of them for Christmas teacher gifts this year! I enjoy crocheting hats. Something that I can finish with a busy household. Fun hats for kids! They work up pretty fast and it’s so cute to see them wearing the hats. You can never have too many! First I want to thank you for all the hard work you’ve put in and continue to put into your site just to help people learn to crochet! That’s just fabulous of you. Second, I have a really difficult time choosing a “favourite” anything. I do enjoy making blankets and scarves that I can experiment on, use different stitches in different sections. I love to crochet gifts to give! I love crocheting blankets and little stuffed toys. I love to crochet everything, but I am a texture junkie so I tend to gravitate toward patterns with cables. I keep seeing crochet cables that I love but I have yet to try it out! I usually knit if I want to work cables but I love the texture of crochet too. I love Giveaways! thank you for the opportunity. There’s always something new and interesting here….so glad I found you! My favorite thing to croche is head warmers and scarfs. fav thing to crochet is lacey stuff with thread. I love the look of lace, love 2.5 – 5mm hooks. Love size 10 thread. Love learning unique stitches and those with texture. Christmas angels and lace gloves and doileys. That’s awesome! I love lacey stuff but I’m not very good at it and get frustrated. It just takes me forever, but I did make one tiny lace angel and she was my favorite thing for a long time! Oh, lovely! DO you have a specific pattern you like? I love to crochet baby sweaters and toys. I have made afghans but struggle to finish them, I get bored. I have found 2 patterns that I can make it through though. I just started C2c and am enjoying that a lot. My favorite thing to crochet is a hats and scarves!!! I live to make blankets and afghans and any kind of flowers. Flowers are so satisfying to make! All the different kinds and they’re so quick to do . I love to crochet amigurumi. I swore I never would and now I can’t stop :-). Amigurumi are the best! I never knew that was a thing when I made my first little elephants years ago, but I’m so glad it is! I’ve seen so many adorable patterns online! My favorite things to crochet are baby afghans and scarves! I love crocheting baby blankets too! I’ve only made two scarves, but working on my third now. I love to crochet hats for my kids and my daycare clients! Seeing their face when they open it up is the best! I love to crochet hats for my kids and my daycare clients! Seeing their faces when they get a new one is soooo cute! Makes my whole day! I’ve never made a crochet bag before, only pouches/cases but definitely something I want to try. That is incredible! It’s always nice to be able to share our craft, but it’s another to go out of your way to take care of others with it. Your community is lucky to have you. What’s the organization called? Would I be able to take a look at a website? My favorite thing to crochet is ear warmers and mittens! Would love to try these hooks!! I haven’t had time to try one yet but I LOVE the ones I’ve seen online! Maybe once I get all my current projects done, I can do that. My favorite thing to crochet is beanies and matching scarves. I enjoy making them and blessing people with gifts made with love. That’s so nice of you, Karen! The best thing about crocheting is being able to share it, isn’t it? I’m working on a beanie and matching scarf for a nephew right now! My fave things to crochet are afghans and baby dresses. Baby dresses are the cutest! I made a bunch when my nieces were little, but haven’t made any since. I like making small blankets/throws because I can add as much, or as little, detail as I care to and in whatever colors I crave. I love to crochet just about anything, love the small projects for instant gratification and the big ones because there is a sense of accomplishment when done. Pick me…pick me! Hahaha I love crocheting baby sweaters. I love seeing babies in the sweaters I’ve made. So tiny and cosy! 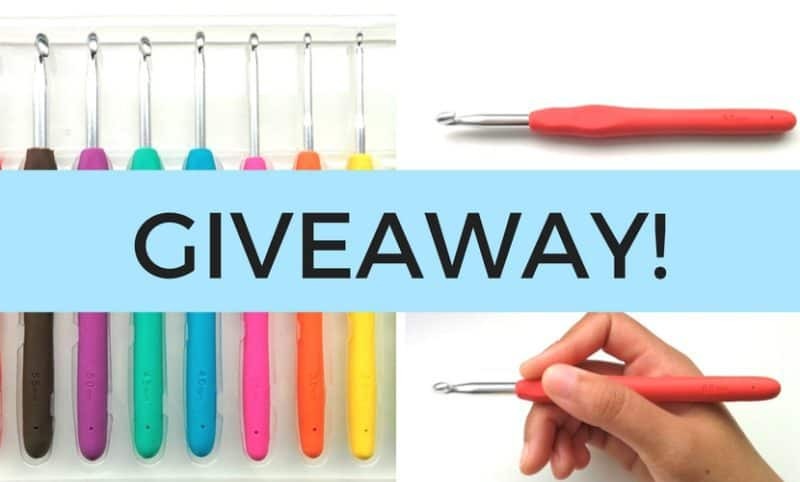 Wish your giveaway was open to all as I live outside the US and Canada but find your website very helpful since I am new to crocheting. Thanks, Gillian. Because this is the first giveaway, I wanted to make it a little easier on myself in case there was any shipping problems, but I’ll do more giveaways open internationally in the future. Where are you from, if you don’t mind me asking? I learned to crochet and knit as a child, at school and with my family. A little over a year ago I took on crocheting again and haven’t been able to spot since. I just Love it!! I’ve done some amigurumi, baby blankets and dollies. I did a neck cowl for my sister and just got started on two baby blankets. I am figuring out what kind of yarns I like to use, what kind of hooks, and for one of the blankets I just started even made a diagram… I am just Thrilled!! All I want to do is crochet all day long… Thank you for your blog and everything you post. I have found lots of useful information and lovely patterns here. haha, I know the feeling, Irina! When I started, I really just wanted to recreate a hat I saw, but now I can’t get enough and I always have a project or two on the go at any time. lol I’m working on a pair of gloves and a beanie/scarf set right now! My favorite thing to crochet – afghans/blankets. So many different styles & patterns. Plus I can do them without thinking once I get the pattern down. I also like to do garden flags. Just started those but so cute! I haven’t heard of crocheted garden flags before, but I love blankets/afghans too. I can pop on a TV show and just work while watching! Lately my favorite things to crochet have been shawls and wraps. Thanks for the chance to win these awesome hooks! Thanks for entering, Nora! Good luck! The only thing I make so far is blankets but I AM getting better since following you!! Thank you SEW much for a chance to get a set of your fave hooks. You ROCK!!! That’s so nice to hear, Chelle, thank you! Blankets are a great place to start, even though they can be big and take time. They give you a chance to practice stitches and get them perfect! I’ll share more beginner’s patterns here so you have more options on what to make though! The new layout of your website is looking good! I love to crochet afghans. So many patterns, so little time…..
lol I know the feeling, Lynn. My list gets longer and longer every day! My favorite thing to crochet is baby blankets because I am able to finish them! I have many other blankets started and unfinished. But I think my new favorite thing to crochet will be the adorable giraffe that I am starting thanks to your pattern! I love baby blankets too! The one adult sized blanket I made took me forever and then I got bored, so I opened it all up and reused the yarn! Still have not made an adult blanket since then lol. Thanks! The giraffe is one of my absolute favorite things I’ve made. I hope you love it!